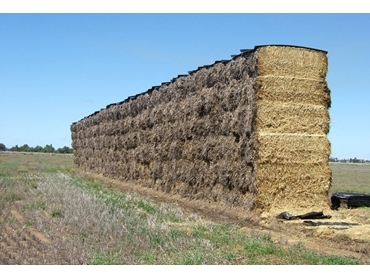 Hay Cap is a unique product that protects hay stacks against rain, mould and rot. Hay is required to be stored properly until the market needs it. Cereal hay made in 2010 that couldn’t be sold in 2011 is now in high demand in 2012. However buyers and transporters don’t like mouldy or rotten hay, and uncovered stacks can lose as much as 50% of the bales if exposed to rain or when storage conditions are not up to mark. Hay covers are a cost effective, safe and durable way of covering hay, and are now widely accepted as a better method, protecting an estimated quarter of a million bales of hay last season. Invented, manufactured and marketed in Tocumwal, NSW by specialist hay producers Phil and Lynda Snowden, Hay Caps have proven a winner on their own farm with Mr Snowden selling 4000 bales of 2010 season oaten hay this winter with minimal losses. In spite of 910mm of rain over 15 months and a mouse plague, they were able to sell most of the Hay Caps-covered stacks.